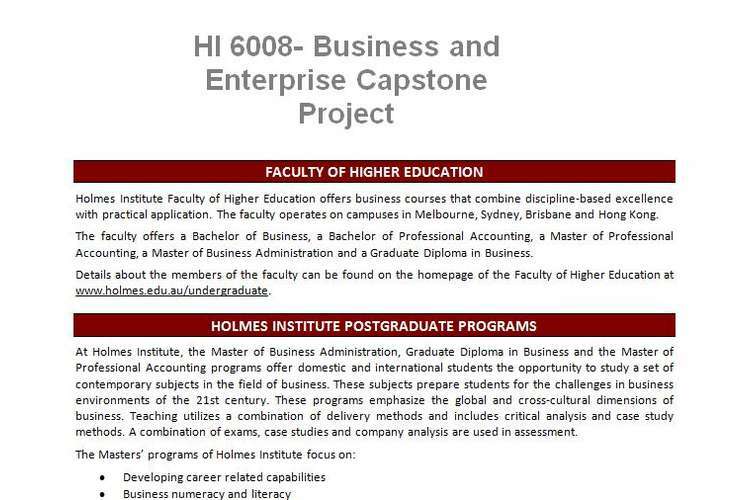 Welcome to HI 6008 Business Enterprise Capstone Project Assignment. This capstone subject of your course is process-oriented rather than concept-oriented. By this we mean that this subject is not intended to add to the set of concepts you have already gained from all the other subjects. Instead, it focuses strongly on the processes involved in utilizing those concepts in a substantial business project and on the processes involved in communicating your ideas in an effective manner. The main outcome from this subject is your project report which is a key element in your personal portfolio which you will use in interviews and carry with you from job to job for life as an illustration of your capabilities. From your first day appointed to a new job, as an MBA graduate, you will be expected to be a ‘self-starter’ capable of independent work. It is likely that your immediate supervisor will delegate a project to you to give you a chance to demonstrate your capabilities. The project will have a strong business focus e.g. What are the business implications for our company business in changing our broadband provider switching to the National Broadband Network. While you can expect some help from your immediate supervisor, they will not be impressed if they have to ‘nurse’ you through every step of the way through the project. Companies will expect you, as an graduate, to be capable of conducting creative, innovative and productive research under minimal supervision. This subject will prepare you for undertaking independent project work. Such projects commonly take the following form: first, through consultation, you will have to develop and agree a plan outlining the tasks associated with the project together with negotiated deadlines; then you will dig out relevant facts (research); and ultimately develop, document, and then deliver your findings in an effective manner. As has been mentioned above, this final report constitutes a key element of your personal portfolio. In business, live presentation is also a common means of delivering a message effectively. The opportunity to develop that skill is provided by the Seminar Program which is integral to this subject. You may deliver your seminar either at the beginning, during or at the end of your project. A further opportunity to extend the capstone project in subsequent semester(s) is provided for those students interested in qualifying for the doctorate level studies and/or conducting business requirements as a career. Students who choose this option continue with their project into the next semester deploying qualitative and quantitative techniques to complex business problems. Research questions are defined, primary and secondary data are collected, analysed and interpreted. Statistical techniques and SPSS® are used to produce a final capstone project thesis and final project presentation. To achieve these aims the extended business research capstone project will address: the principles of business research; how to frame and generate research questions; ways of asking questions that can be researched, the history and variety of the major research paradigms; the theory of measurement, scaling and numbers; ways of choosing a research methodology; sampling theory - its logic and application; the major methods of data collection - surveys, questionnaires, interviews, and indirect methods of data collection; the formal experiment; and qualitative and quantitative analysis of data. ……choices of accommodation and suburb domicile. Based on the theory of ethnic agglomeration. ……. A comparison of different institutions where international students study in Sydney. A survey of the options and differences between institutions. 2. An investigation into the growth of the sharing economy and how it has disrupted traditional businesses. Vitamin and supplement market in Australia and an analysis of why China has growth potential. A case study of “Blackmores” and the opportunities for vitamin experts to India. Domestic service industry (house cleaning and meal preparation, dog walking and grooming and lawn mowing). The size of this market, the factors driving this market and the prospects for new businesses within this sector. Cosmetic industry – a contrast between two businesses with different business models, eg Sephora, Body shop and LUSH. Asian versus European complexions and its reflection in product differentiation, and prospects for cosmetic growth in developing Asian countries. The hospitality, cleaning and security industry and part time and causal work related to the supply of international students to this market. The incidence of exploitation in these industries. The car wash industry (fast food) and the demographics of the suburbs where outlets locate. Factors affecting business location. 5. The incidence of mono-lingual speakers and multi-lingual speakers in the Australian population. The advantages of a second language in terms of national and international work opportunities, within Australia and outside Australia. 6. The sunscreen market in Australia and factors driving this market (melanoma incidents globally). The potential to educate and sell sunscreen to visitors to Australia. 7. An investigation into cancer rates in Asian countries, the causes, consequences and preventative measures. Business opportunities arising from this analysis. 8. An investigation into the consumption of sugar within compared population and rates of obesity. The health and economic consequences. 9. An investigation into the differences in cigarette smoking in Australia compared with an Asian country. Are cigarettes an inferior good, how important are government policies towards cigarettes in affecting consumption? 10. An investigation into gambling within Australia. An analysis of the nature of the gambling industry. Who benefits and who loses as a consequence of this industry. 11. An investigation into power generation within India (or another country). What is the future direction that this industry will take. What are the costs and benefits of this strategy? 12. An investigation into a comparison of either –Volvo cars or Jaguar/ Land Rover cars before with after its ownership by either a Chinese entrepreneur or an Indian entrepreneur. 13. An investigation into the child care industry –or- aged care industry in Australia. How and why have these industries grown overtime. Will this growth be replicated in the sub-continent countries as its income per capita grows? 14. An investigation into how couples choose their marriage partner. How do western countries differ from eastern countries. What does divorce rates illustrate about the relative success of each system? 15. An investigation into adventure tourism in Nepal or in comparison with adventure tourism with Australia.